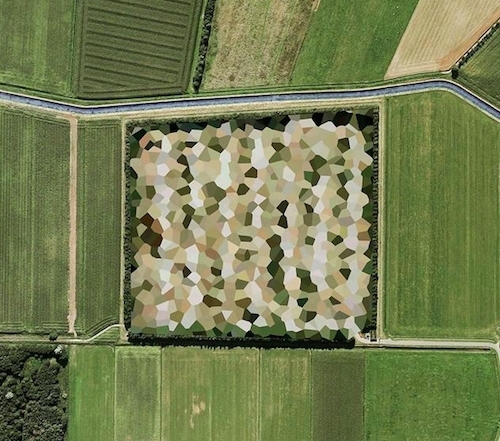 Mishka Henner, Nato Storage Annex, Coevorden Drenthe, 2011, archival pigment print, dimensions variable. Scouring Google Earth for satellite images of oil fields and feedlots, Mishka Henner uses surveillance as camera and canvas, producing images that question the place and relevance of the photographic machine. The photographs on view are products of digitally stitched images that on the surface look like gleeful color assortments: green pastures, earth tones, organic red shapes, aerial shots of oil fields evocative of shimmering motherboards. Belying the aesthetic prowess is the account of the nefarious consequences of human intervention on the planet. This is best exemplified by Coronado Feeders, Dalhart Texas, 2013, in which cows can be seen roaming in their own excrement inside a gridded plot of land, at the bottom of which is a red lagoon where waste is collected and chemically processed. Henner’s dystopian accounts take on another form with I’m not the only one, 2015, a single-channel video where various YouTubers seek their fifteen minutes of fame by performing a cover of the renowned song. The mosaic formed by these faces singing in unison—each in its own setting—is telling of a world where the increasingly broken down communities into isolated cells where the screen is the only space left to come together.